Today, Mountain Boy Minerals Ltd. (“MTB”) reported significant metallurgical test results on the massive sulphide-barite mineralization in core from last year’s drilled hole DDH-SC-2016-2 (18.94 m @ 46.73% barite, 1.21% zinc, 0.31% copper, 0.12 g/t gold, 28 g/t silver and 0.03% lead; the full width of the zone was not intersected as drilling was terminated due to bad weather and freezing of the water source). Considering these excellent metallurgical test results and the potential for extensive barite zones at or near surface at the Ataman Zone on the Surprise Creek Property in the “Golden Triangle” area of British Columbia, it becomes clear that MTB now sees itself in a position to attract strategic industry partners to bring the project to the next level. As the Ataman Zone is only one exposure of a number of VMS zones located on the property, MTB’s work during 2017 will explore and define other sulphide, sulphide-barite zones as well as barite veins. 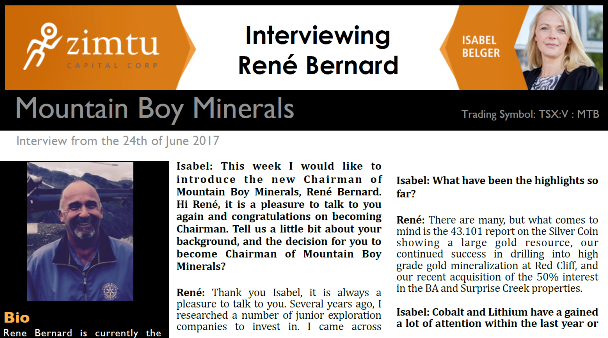 See Initiating Coverage for further information on MTB’s projects and management team with considerable “skin in the game”. The metallurgical testing used drill core from the Ataman Zone, a mineralized system that has been traced over 1,200 m of strike length. Along the northeastern end of the exposure, it is 650 m wide by 600 m in height. The initial metallurgical work was done by SGS Laboratory in BC. The work included flotation methods to recover the copper and zinc minerals and subsequent flotation of the tailing to determine barite recovery as well as purity. 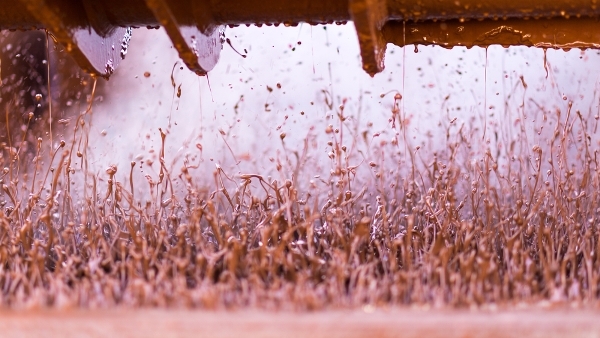 The concentrate from the barite flotation was then sent by SGS to Ana-Lab in Texas to determine the levels of any impurities that may hinder use as in oilfield drilling. After successfully separating copper and zinc sulphides with good recovery, the barite was floated with excellent recovery rates. SGS recovered a copper grade of 26.2% at 70.5% recovery and a zinc grade 53.8% at 89.1% recovery in the open cycle batch test. The lab estimated that the recovery should be higher for both copper and zinc in a closed circuit test. Further testing on copper and zinc recoveries will be carried out on 2017 drill core. Gold and silver metals are mostly contained within the copper concentrate. The initial flotation results on the tails from the sulphide flotation tests indicate a product with 91.6% BaSO4 at 83.2% recovery. This was an open circuit test, and there was 10.8% barite in the intermediate product from the sulphide tests. SGS estimated that the final recovery should be higher than 83.2% (should be close to 90%) but this can only be confirmed by locked cycle test in future. The SGS test results will be posted on the website upon receipt of the final report. Surface work in 2016 on a 25 m wide barite zone, located 120 m west of DDH-2016-SC-2, yielded high barite values along with significant base metal values. See map on the right showing this sampling. The surface work also indicated barite zones extending to the mountain top. In addition to a main barite zone, numerous shears contain barite and sulphides. On July 5, MTB announced to have intersected visible gold in the third hole (see pictures on the right) of an ongoing drill program at the Red Cliff Property in the “Golden Triangle“ of BC. MTB formed a joint venture with Decade Resources Ltd. (TSX.V: DEC; market capitalization: $12 million CAD) with MTB owning 35% and Decade the remaining 65%. Since July 5, Decade has traded some 12 million shares, currently at $0.12 CAD (+71% in last 9 trading days). Considering that MTB owns 35% of Decade‘s flagship Red Cliff Project, the upcoming drill results may also have a substantiated impact on MTB. Mr. Kruchkowski reports that the company is currently engaged in a respectful consultation and accommodation process with local First Nations represented by the Lower Similkameen Indian Band. After an initial “Preliminary Environmental Assessment“ (P.E.A.) review conducted by the Lower Similkameen Indian Band , the company has now asked for and received a cost estimate for required field studies, project coordination and meet with Chief and Council .Field studies will start once scheduling can be arranged. In describing the “Manual Creek Tuffs“ Mr. Neil Church, Ph.D., P.Eng identified an area measuring approx. 5 square km along a 5 km long belt with zeolitic beds ranging up to 10m in thickness. Here he estimated that the amount of tuff sub cropping the glacial till is estimated to be about 5MM tones in an area of only 20 hectares. From his calculation and sampling statistics the accessible zeolitized tuff is estimated at 4MM tones and the calculated clinoptilolite bearing tuff at 3MM tones (Assessment Report 26889). The Company has not verified this data and it is being used for reference purposes. Mr. Bernard, the company‘s Chairman states: “We are delighted to hear constant news about the growing importance of Zeolite in a host of applications, ranging from farming (including hydroponic), animal feeds, environmental remediation to name a few. The “Manual Creek“ zeolites offer significant deposits to supply these markets for years to come from a strategic location with excellent infrastructure close to the U.S. border and rail connection in Oroville, WA. We are looking forward to work with the Lower Similkameen Indian Band and local First Nations seeking their approval to develop these resources for our mutual benefit“. The Company is exploring the property in joint venture with its partner. A drill program is underway and results were announced in news releases on June 20 and July 5, 2017. The Phase I drilling is continuing on the both the Red Cliff and Montrose zones. Metallurgical work is also being conducted on core from DDH-MON-12-62 in order to obtain possible recovery methods. Full version / View looking north at drill access trails from the area of the Red Cliff workings.